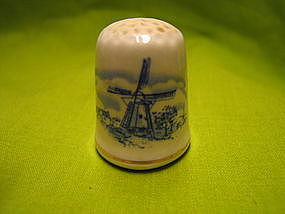 Fragile porcelain thimble with older red Japan sticker. There is no damage. I need your zip code to calculate the postage. 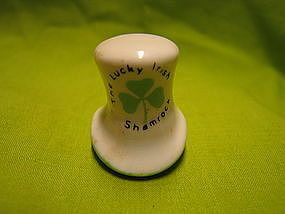 There is no damage to this porcelain thimble. I need your zip code to calculate the postage. The photo shows the front and back design. There is no damage. I need your zip code to calculate the postage. 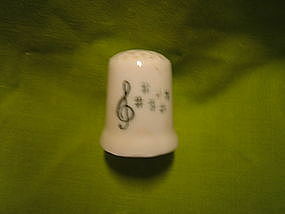 There is no damage, but it looks as if there was a factory miss on one of the musical notes. I need your zip code to calculate the postage. There is no damage, but it needs cleaning, but I've damaged too many things lately in the name of cleanliness. I need your zip code to calculate the postage. 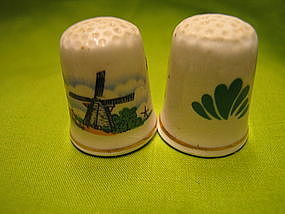 The thimble was manufactured in 1982. 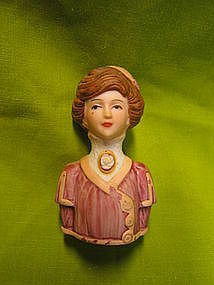 There is a small spot of loss of finish on the collar. 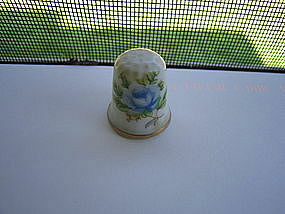 This was not wear, it just came off on my finger when the thimble was placed on the rack. I need your zip code to calculate the postage. 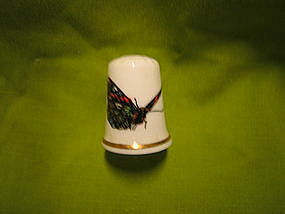 Butterfly thimble marked as Theodore Paul England Fine Bone China. There is no damage. I need your zip code to calculate the postage.